for their walking away there are no other answers! and to those who left. and who to keep away! and then suddenly to learn to leave those beloved? to grow into marvelous trees. to transform into a butterfly and fly with ease. but cherish how your soul upward flees. Yes, I know it’s not easy… There are moments when overcoming the pain seems easier, but then there are moments which just crumble us and don’t let us see any point in them… Yes, many times it’s really hard, but let’s just try! I will never miss you! how cruel some people could be! oh I owe it to you cruel betrayer! will burn and hurt forever! Still struggling with my pain I came to this amazing video and song yesterday. Needless to mention how much I cried with this very impressive video. It is very sad but at the same time looks at death through a different frame which leaves you some hope. I’d like to share this song and video with everyone who have lost someone very dear in life. Wishing for our beloved ones who left, eternal peace and happiness, and so much strength for us who remain with the pain to go on, until the day we will meet them again. showing me, telling me the way to go. now how can I dare to draw? but what can bring you back? when there will be a simple track? I’m happy with the result, but hyper realism is still far away! Here’s the result of 17-18 hours of sacrificed sleep! 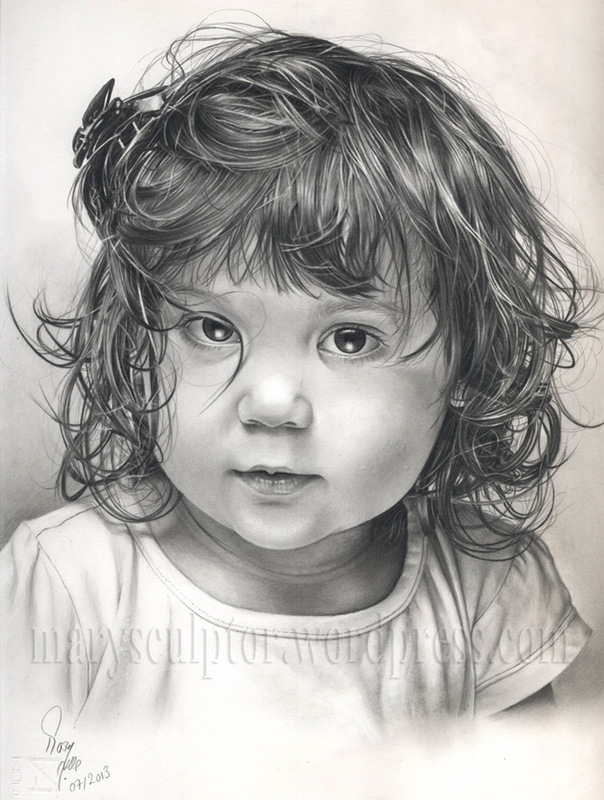 Another portrait drawing using my old mechanical pencil. Well, if you look at the original photo you’ll definitely notice that the model is much more beautiful than my drawing! Unfortunately I realized it only after scanning my finished work and comparing it to the original photo on my PC. However I think I’ve learned a bit from my mistakes, hope to be able to avoid some of them for my next drawing. 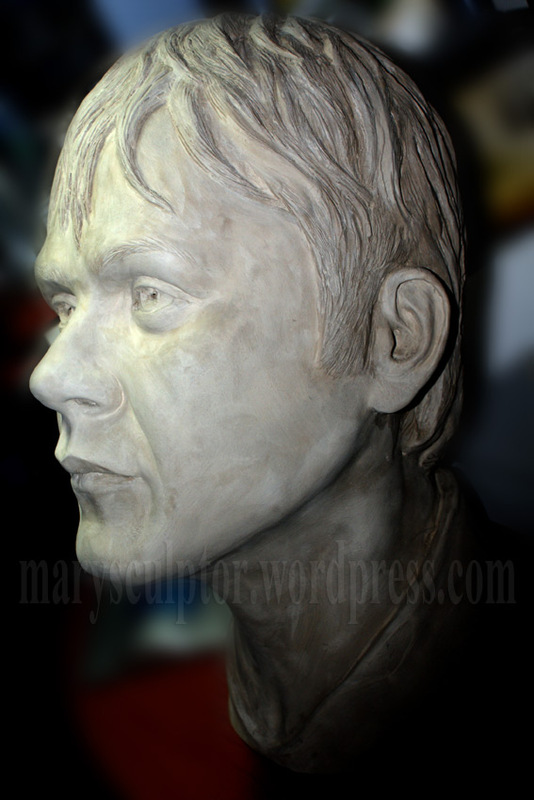 Although I’ve not been successful in making the drawing look like the model, I’m somehow happy with the final result. The image of the final work posted above the steps gallery is taken by scanner, however there are subtle differences in respect to the original work. Like the bright area on her nose, in the original drawing that area is less evident, although the shaded areas are similar to the original drawing. I don’t know whether the problem is my scanner, or it is the problem with graphite pencils, ’cause it seems mission impossible to capture my graphite drawings as they really are! Hope you liked this post. Can’t wait to read what you think about it! First portrait using watercolor pencil! Guess I’m back to my creative mood again! I have started a new drawing few weeks ago, but because of my not-collaborating mood, it has become one of those really slow and gradual drawings, which remain untouched for several days or even a week! Until 2 days ago while putting in order a closet, I accidentally found some watercolor supplies I’d received as a gift times ago. Following several great watercolor artists on WordPress, I have been inspired a lot to try this media. 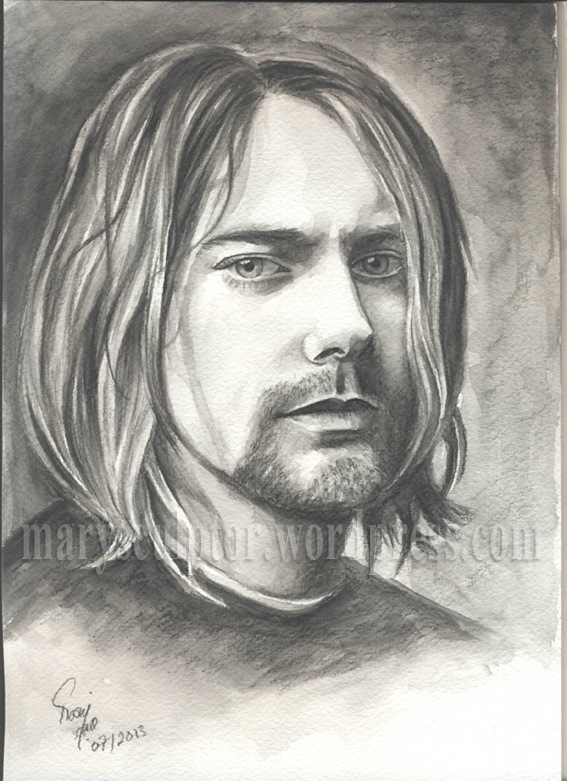 So I just couldn’t help but grabbing the black watercolor pencil and trying to draw a portrait, using one of the Kurt Cobain’s famous photos as model, ’cause it was in black and white and old enough. The result is not comparable to the work obtained by mechanical pencil, the hair on the left side for example doesn’t even look like hair! lol The fact that I did all in less than 3 hours is just hilarious for me, specially because it was my first try with watercolor pencil. I’m curious to see how it would work with real watercolor for me, ’cause watercolor pencils are easier to use. Click on the image to see a bigger image. Harbor glance – drawing finished! Finally it’s finished! Here is the scanned image of the completed drawing (I used compuet to add the watermark on it). I did my best to scan it the nearest possible to the actual drawing, struggling with the scanner light settings, but it always came out too light or too dark. This one represented the original work the best, but it’s slightly darker. I think the problem is the graphite itself, using a camera or scanner doesn’t make a big difference, it reflects light very much, specially when the whole drawing is done by an HB lead. I think the harder grades reflect the light more when they are pressed a lot on the paper. Here are some photos I managed to take occasionally. Again working at night with lack of proper facilities they just came out with a horrible quality. I tried to fix the lights a bit on computer, but not very much could have been done. However I’m posting them to show you some steps of the drawing process. It took about 30 to 35 hours of work and the tools used for it as I’ve probably mentioned before were: Fabriano 220 gr. 22×33 cm smooth white paper, Pelikan kneaded eraser, mechanical pencil with HB 0,5 mm Staedtler leads. For softening the bigger shaded areas I used make-up cleaning tissues (cosmetic cotton-wool pads), and for the smaller parts “ear cleaning sticks”! Yes, you read it correctly! 😀 Well, I had received this box of cosmetic pads and ear cleaning sticks some times ago, when I read somewhere on internet that cosmetic pads are great as smoothing tools for graphite drawings I opened the box, and then a lamp was lighted in my mind looking at the ears cleaning sticks: they would work as smoothing tools for the fine shades! And they worked! Thank you for visiting my blog and reading this post, see you soon in the next post (crossing fingers!). Ah it drives you nuts when you don’t have the right tools, worse of all when you don’t have any time, but insist to do a work anyway! No, I’m not happy, but I won’t loose hope. Next time I’ll try to make a smaller sculpture which will be easier to manage, and create some better tools (like the base), paper just couldn’t resist the weight of that much clay, indeed it ended up with some cracks at the neck, ’cause the weight of the head applied so much pressure on the neck. He is Tom Meighan, the singer of Kasabian Band. What do you think about it? Do you find any resemblance?! I took many shots, but with lack of light and a too amateur photograph (me! ), they just didn’t show the details I liked to get. The following photo is one of the few shots which I liked, used flash light for that, then improve the lights in Photoshop. I’d like to record a brief video, turning the sculpture around, but not having any rotating base, I should wait a bit.